COM/ActiveX control has been around for more than a decade. In spite of all, it is very difficult to get a complete Windowless container. MFC dialog has its own Windowless container that is truly windowless compare to ATL but if your project can't afford to depend on MFC, you are on your own. The container I am presenting in this article offers complete support to Windowsless controls. It is developed especially for ATL/WTL project and can be used to create composite controls. That means, you can combine multiple Windowless Controls to create your own component. 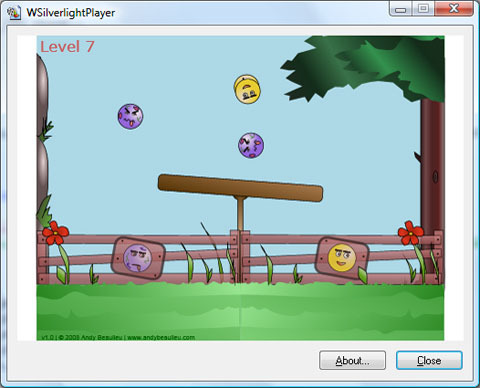 Imagine being able to encapsulate Adobe Flash, Windows Media Player and Silverlight into your own component. Another advantage you will find with these classes is that the learning curve is quasi zero if you have any previous experiences with ATL. You simply derive your dialog from the new dialog class to get the full power of this container. Having a full-blown windowless container can be very useful. I hope that you will find some great uses for it. I will describe the process necessary to integrate the container in your own project. Later, in other articles, we'll explore how we can take some of this to a new level. Think about this, wouldn't be great if you could integrate Silverlight and Flash contents seamslessly and interact with them within your C++ application? If you want to be proficient at developing Windowless controls and their container, you have to rely on the OC96 Specification. Basically, you need to know and understand several things. ActiveX Controls should be developed to conform to apartment-model rules to ensure they behave correctly. That is, you have to think in term of UI thread and make sure that your object is thread safe. If your object uses global variables, it should synchronize access to them. By supporting the windowless control specification, a control can make efficient use of its container's window rather than having a window of its own. This results in using fewer system resources and improves performance through faster activation/deactivation. Providing windowless support not only provides transparency for interesting visual effects, but also further improves the performance of the control. Hit detection is provided so that a windowless control can have an irregular shape and to complete the visual benefits of transparency. 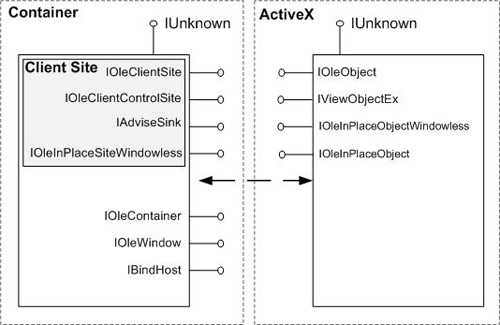 The container calls IViewObjectEx::QueryHitPoint of the control. In return, the control detemines if it has been hit and returns an indication to the container. A control can use any of IPersistStreamInit, IPersistStorage, IPersistMemory, and IPersistPropertyBag as a Persistent Embedding mechanism. A control may implement more than one of these interfaces if it wants to. The container being presented with this article supports only IPersistStreamInit but IPersistPropertyBag may be added in the future in order to support a wider range of controls. Because the container interface is passed to the control, the entire object model of the container is available and can be manipulated by the control. Consider for example this same scenario with Internet Explorer, a control access the entire DOM tree (IHTMLDocument) and change background color of the document. What this means is if you develop a custom container or composite control, any control that is hosted into your dialog surface can get access to the methods and properties that your object model supports. The following diagram shows the main interfaces that come into play. The container is also responsible to managing input focus, mouse capture and associating moniker for the object. The container dispatches mouse and keyboard messages to the windowless control by calling the OnWindowMessage method of the IOleInPlaceObjectWindowless interface. That way, the control may respond to regular inputs when it has focus. This is about all there is to it but the ActiveXContainerImpl class makes this process really transparent. Now, let's see some of it in action. Hosting ActiveX controls inside of a dialog is basically the same as you did with ATL. You can safely rename your base class from CAxDialogImpl to CAxWindowlessHost. This class inherits from CDialogImplBaseT, thus, will have the same capabilities as any Windows dialog. Let's get this started with some examples. The examples below assume that the controls are inserted using 'Insert ActiveX Control' from the dialog editor. You still have the flexibility to create everything manually at runtime. Windows Media Player supports windowless activation. Assuming you inserted a media player onto your dialog. The example below shows how you can turn it to windowless mode. Note that in the case of Windows Media Player, a custom property dialog is also available so you can configure your control at design time. 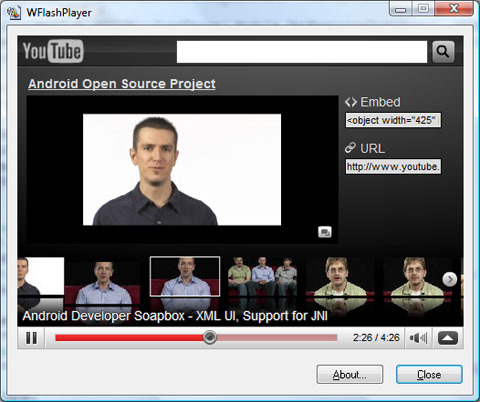 You can also host Flash content. Flash animations can be loaded for external file resources or retreived from the internet. For example, you can add support for YouTube video provided that you specify correctly the URL of the resources. The example below shows how to initialize Adobe Flash player to host an animation or video. Setting Transparent mode is necessary to turn Adobe Flash to Windowless mode. XAML and Silverlight application package (.xap) can be hosted using Microsoft Silverlight ActiveX control. For security reasons, you can only load data from file:/// or http:// moniker. It would have been nice to support the resource protocol (res://). The example below shows how to configure Silverlight to load external resources. In this example, the control is prevented from receiving right clicks so the context menu is never shown. The demo shows how to use Silverlight in Windowless mode. A huge number of demos would have to be presented if I had to consider all the ActiveX controls that we have at our disposal. Windows Form ActiveX controls can be hosted by your application as well. A demo is provided here as well. This article presents a complete and real solution for the ATL windowless ActiveX container issue. I've described the steps necessary to integrate three popular controls in your own dialog. It is quite easy to use other ActiveX controls as well. The container may be used to develop custom composite control. Probably the most interesting part was to show how you can integrate Silverlight Application packgage (.xap,.xaml) within your solution without little effort. I hope you will consider the features that it offers and put them in use in your own program.